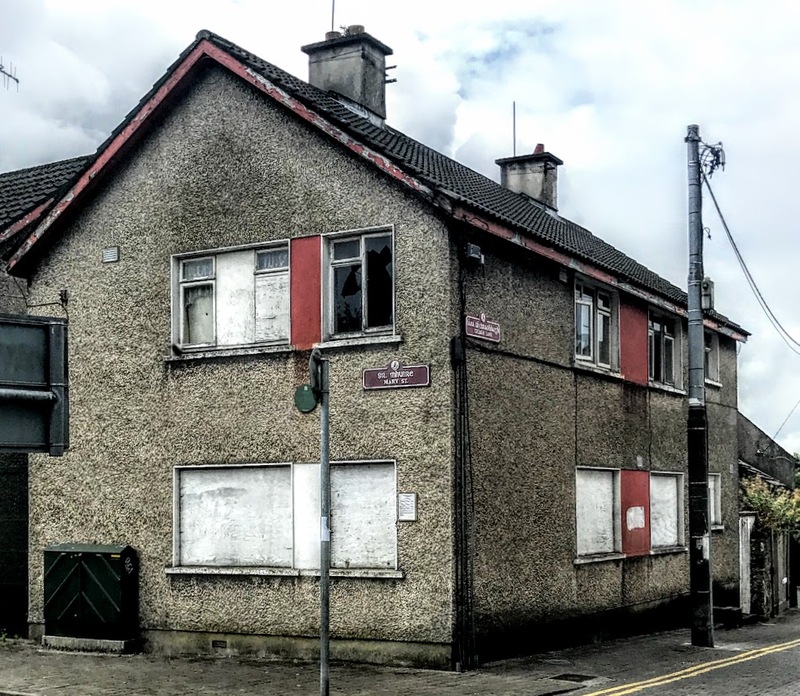 The Chas Flats are part of a boarded-up complex of apartments, with broken windows and doors and a sad air of abandonment, on the corner of Mary Street and Creagh Lane, awaiting redevelopment in heart of the old city on King’s Island. I’m the leader of the Band”. This is one of the oldest parts of Limerick, the street names are reminders of the city’s mediaeval legacy, and these houses stand beside Fanning’s Castle, a tower house dating from the 16th and 17th centuries and built by the Whitamore and Fanning families, two of the leading merchant and political families in late Tudor, Stuart and Cromwellian Limerick. A few doors away down Mary Street, the band room of Saint Mary’s Band Room bears the date 1885. But the building was erected in 1922, and the date refers to the foundation of the band in 1885. 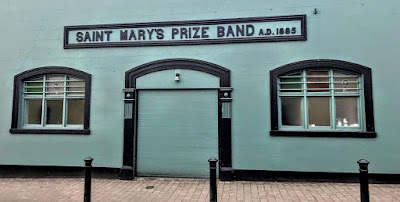 Three years later, in 1889, Shamus O’Connor and John J Stamford wrote the first version of ‘McNamara’s Band.’ The song was originally about a one-man band, but people in Limerick insist it was inspired by Saint Mary’s Band, which at the time included many members of the McNamara family from Saint Mary’s Parish. Stamford, who wrote the lyrics, was then the manager of the Alhambra Theatre in Belfast and the song was written expressly for the theatre’s owner, the Irish-American music hall veteran William J ‘Billy’ Ashcroft. Saint Mary’s Fife and Drum Band was founded in 1885. 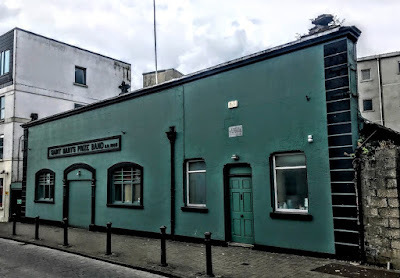 From its humble beginnings in the Yellow Driller on the King’s Island, it moved to Nicholas Street, then to Barrington’s Mall, Fish Lane and finally in 1922 the new band room was built in Mary Street. The band was the brainchild of Patrick ‘Todsy’ McNamara, an Abbey fisherman, and many of his fisher friends formed the original band. The founding figures in the band included Paddy Salmon, Steve Collins, the brothers Patrick and Michael McNamara, Paddy (Halley) Kennedy, Jack Gogarty, Jim Ring, Paddy (Sparrow) O’Donoghue and his two brothers, Ned Walsh, John Lynch, Tom Forward, Jack McNamara, John Hayes, Jim Doyle, and Gerry, Michael and Jimmy Frawley. At its first attempt in September 1885, the band won the All-Ireland Championship under the baton of Steve Collins. 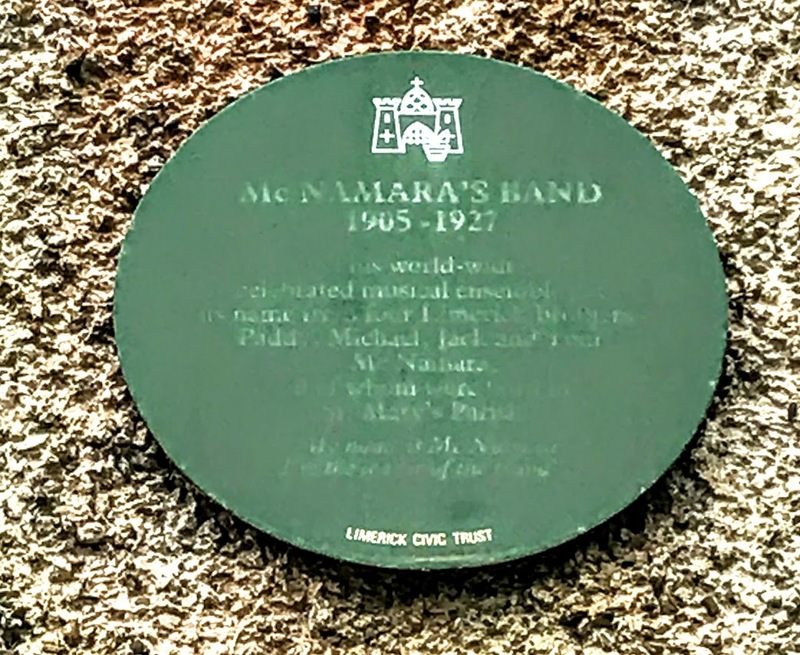 By the late 19th century, Saint Mary’s Fife and Drum Band included the four McNamara brothers named on the fading plaque – Patrick, John, Michael and Thomas – and played throughout Ireland. 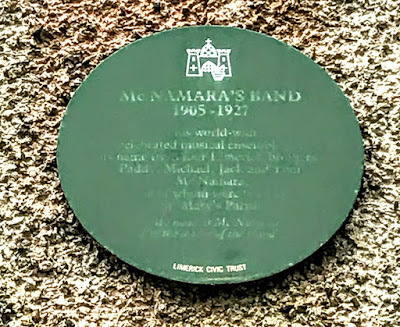 In the early 20th century, Patrick and Thomas McNamara emigrated to New York, where they formed ‘McNamara’s Band’ with Patrick ‘Patsy’ Salmon, another Limerick emigre. When Patsy Salmon left, Patrick and Thomas McNamara formed ‘McNamara’s Trio,’ with Thomas on piccolo, Patrick on violin and Patrick’s daughter Eileen on the piano. The trio recorded and released several songs. During World War I, three members of the band were killed in action within six months of each other in 1915. John McNamara, who remained behind in Limerick, enlisted in the Royal Munster Fusiliers and fought in the Second Boer War and World War I. He was killed in action on 9 May 1915, and his body was never recovered. He is remembered on Le Touret Memorial in France. A recording of ‘McNamara’s Band’ features in the film The Way to the Stars (1945), in which Stanley Holloway leads the crowd in a pub close to a Royal Air Force base during World War II. Later that year, on 6 December 1945, Bing Crosby recorded the best-known version of the song. It was released early in 1946, when the lyrics were credited to ‘The Three Jesters’ (Red Latham, Wamp Carlson and Guy Bonham). It was an immediate Top 10 hit for Bing Crosby and remains one of his most popular songs. The English Premier League team Tottenham Hotspur also adopted the song as its club anthem. Supporters claim the song was written in Barnet, not far from White Hart Lane, the Spurs home in North London until last year (2017). Other sources say it became the Spurs song because Peter McWilliam was a long-time Spurs manager (1912-1927, 1938-1942) and ‘Mac’s Band’ became his song appropriately. With its Irish resonances, the song was revived at White Hart Lane when the Northern Ireland international Danny Blanchflower joined Spurs in 1954. The song experienced another revival in the ‘Glory years’ of the early 1960s, and continued to be played until last year as the players emerged from the tunnel after half-time and returned to the pitch for the second half. And tho’ we’re small in number we’re the best in all the land. With all the best musicianers you hear about to-day. Oh! a credit to Ould Ireland, boys, is McNamara’s Band! The way we play our fine ould airs fills Irish hearts with pride. That none could do him justice like ould McNamara’s Band. In the Bing Crosby 1946 version, the politics of ‘Ould Ireland’ are removed and the words are made more ‘Oirish.’ ‘My name is ...’ becomes ‘Me name is ...,’ the Prince of Wales becomes General (Ulysses) Grant, and stereotypes are added in the final lines to make it a comedy song. And tho’ we’re few in numbers we’re the finest in the land. And when we play at funerals we play the march from Saul. A credit to old Ireland is McNamara’s Band! The annual celebration, all the gentry will be there. This version also misses the cultural significance of the reference to ‘The Dead March’ in Act 3 of Handel’s oratorio Saul. ‘The Dead March’ introduces the obsequies for the deaths of Saul and Jonathan, and includes an organ part and trombones alternating with flutes, oboes and quiet timpani. It has been played at most British state funerals, and was performed too at the funerals of George Washington and Abraham Lincoln. to play the Tottenham way. are the greatest of them all. In August 1965, Arthur Quinlan interviewed Thomas McNamara, the last surviving member of McNamara’s Band, for RTÉ News outside the venue where it all began in 1885. Thomas, who played flute and piccolo with the quartet, died in May 1978. Saint Mary’s Band has continued to honour the custom of parading through Saint Mary’s Parish on New Year’s Eve and then to Saint Mary’s Cathedral to ring out the old year and to ring in the New.